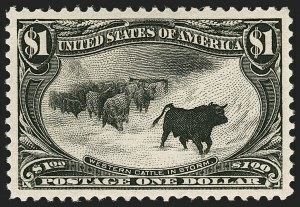 EXTREMELY FINE GEM. 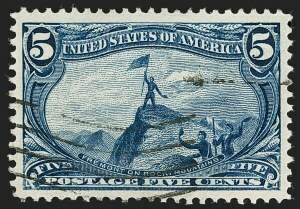 A BREATHTAKING MINT NEVER-HINGED EXAMPLE OF THE ONE-CENT TRANS-MISSISSIPPI ISSUE, GRADED SUPERB 98 BY P.S.E. EXTREMELY FINE GEM. 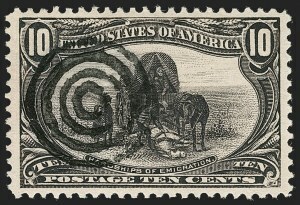 A PHENOMENAL MINT NEVER-HINGED EXAMPLE OF THE 8-CENT TRANS-MISSISSIPPI. 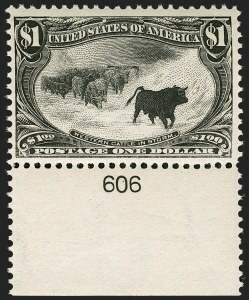 The two most challenging Trans-Mississippi denominations to obtain in Extremely Fine grade are the 8c and the $2.00. 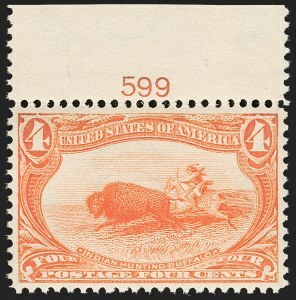 The spacing between horizontal rows on the sheet is narrower than the spacing between vertical columns, making it difficult to obtain stamps with balanced margins. EXTREMELY FINE GEM. 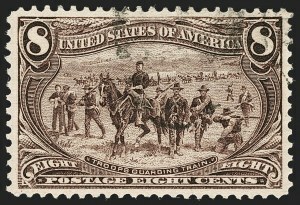 A MAGNIFICENT ORIGINAL-GUM EXAMPLE OF THE $1.00 TRANS-MISSISSIPPI ISSUE, WHICH HAS BEEN AWARDED THE PERFECT GRADE OF GEM 100 BY P.S.E. 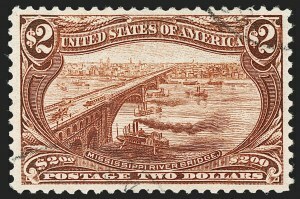 THIS IS THE ONLY UNUSED EXAMPLE OF THE $1.00 TRANS-MISSISSIPPI TO ACHIEVE THIS GRADE, AND, IN FACT, IT IS CURRENTLY ONE OF ONLY TWO UNUSED DOLLAR-VALUE COMMEMORATIVE STAMPS WITH A P.S.E. 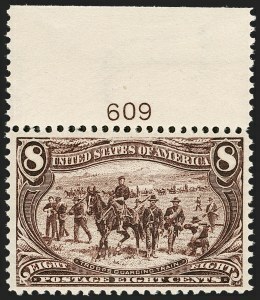 GEM 100 GRADE FOR ANY ISSUE. 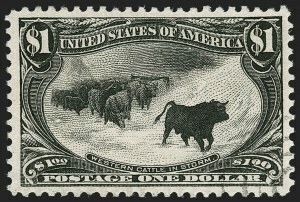 The focus on stamps with a Gem 100 grade is growing more intense as collectors strive for the highest possible ranking in the P.S.E. Set Registry. Remarkably, only two dollar-denominated, original-gum (or unused) early commemorative stamps have achieved a Gem 100 grade (the other is a $2.00 Columbian). With 2012 P.S.E. 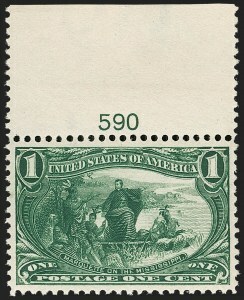 certificate (Gem 100; SMQ $13,250.00). 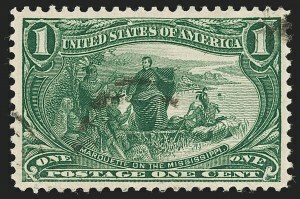 This is the only unused $1.00 Trans-Mississippi to grade Gem 100. 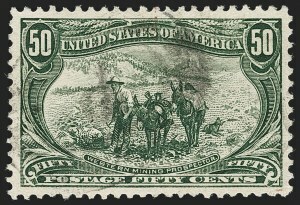 The highest Mint N.H. grade is 98. 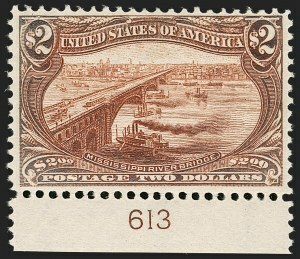 VERY FINE AND CHOICE MINT NEVER-HINGED PLATE NUMBER SINGLE OF THE $1.00 TRANS-MISSISSIPPI.